So those holidays, am I right? I don't know about you, but I feel a slight aversion in my stomach every time a candy cane pops into my peripheral. Don't get my started on how I feel after spying gum drop fairies flying through my thoughts. It's too much. TOO MUCH I tell you! It's not that I'm a ginger grinch and despise Christmas but I don't think my waistline can handle one bit more. So far my fridge is full of fresh veggies from my CSA, leftover Thai/Lao food I made the night before and just, erm… a few beers I snuck back with me from Michigan. Never mind the last part though - I'm rationing those and they are sentimental, it doesn't count. As it is the winter, my CSA has mainly consisted of root vegetables and a few fruits shipped up from California. As a girl can only have so many potatoes and carrots, I've actually suspended my CSA for the next few months. Before I suspended, I received one last CSA right after I came back from Michigan and it was full of, you guessed it, every single type of potato ever grown. Ok, that's a slight exaggeration but you know what I mean. I was sick of your standard mashed/baked/toppings-loaded potato and decided to try out something new. I had seen these floating around the Internet and thought it was due time to try them out. Not only do they look insanely fancy as just an appetizer for one, but they were easy to put together too. 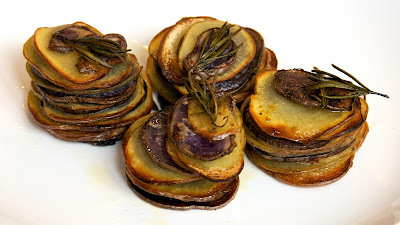 I can't stress enough how much a Mandoline helps here, but regardless of your tools these will be pretty delightful as a side, appetizer or something to singularly stuff your face with. And I don't know how fancy you plan on getting for your upcoming Super Bowl VVIIXXVW (or whatever number it is) party, but I recommending throwing in some of these. If anything, the ladies in attendance will be impressed. Lightly oil the 12 molds in a regular-size muffin pan. (Peel the purple color potatoes, if using.) Otherwise, slice all the potatoes thinly with a Mandoline or a sharp knife. Wash the potatoes, drain well and pat dry with a paper towel. In a large bowl, toss the potatoes with olive oil, rosemary, lemon juice and season with salt and pepper. Stack the potatoes and lay them sideway in a muffin pan and bake for about 25 to 30 minutes or until the potatoes turn crispy on the outside and the flesh is soft. Transfer the muffin pan to racks to cool for 2 to 3 minutes before carefully removing the potatoes. Serve warm.